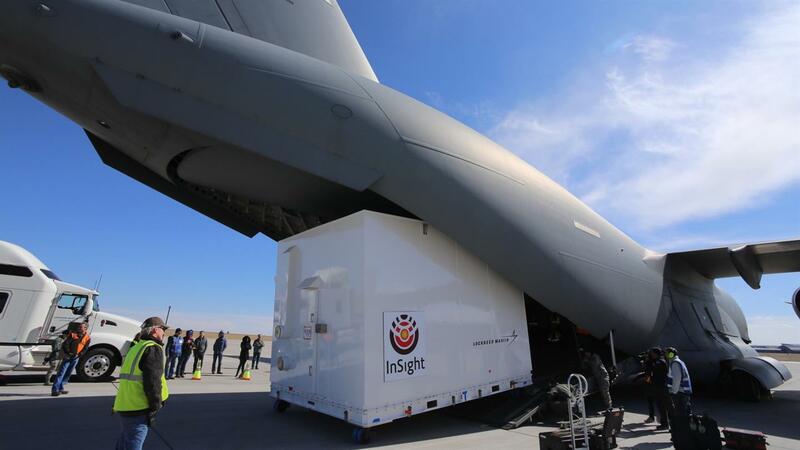 The InSight lander has arrived at its launch site in California. The final tests will now be conducted. The InSight lander’s launch for its journey to Mars is planned for 5 May 2018. There, it will study the interior of the Red Planet. Also on board – the DLR HP³ ‘Mole’. Another step forward for the InSight mission to Mars – the lander has now been transported to its launch site in California. Final tests will prepare the lander and instruments for their journey to the Red Planet. The first 1480 kilometres from Denver to the launch site at Vandenberg Air Force Base in California have been completed – aboard an aircraft. The InSight (Interior Exploration using Seismic Investigations, Geodesy and Heat Transport) lander will now have to travel the remaining 485 million kilometres to Mars alone, following its planned launch on 5 May 2018. Its mission is to thoroughly explore the Red Planet. SEIS (Seismic Experiment for Interior Structure), a seismometer, provided by the French space agency, CNES (Centre national d'études spatiales), will record Martian tremors; the HP³ (Heat Flow and Physical Properties Package) sensor package from the German Aerospace Center (Deutsches Zentrum für Luft- und Raumfahrt; DLR) will analyse the thermal flow from the interior and the physical properties of the Martian surface; and the RISE (Rotation and Interior Structure Experiment) experiment supplied by NASA's Jet Propulsion Laboratory (JPL) will measure the changes in orientation of the planet's spin axis. But before this, the spacecraft and the instruments on board must undergo final functional tests and inspections to ensure that all components have survived transportation to the launch site without damage. The mission proposal for InSight was submitted in 2011, and was selected as a NASA mission in 2012. On 26 November 2018 – after a six-month journey through space – the InSight lander will arrive on Mars. Then, the planet's interior will be explored for the first time. For example, the DLR penetrating probe will work its way down through the Martian surface to a depth of up to five metres, leaving a chain of thermal sensors in the various surface layers. For the Mole's Principal Investigator, DLR planetary researcher Tilman Spohn, Mars is above all one thing – a 'thermal engine' that converts heat energy into mechanical work. "If you want to know how this thermal engine works, you have to be familiar with its energy balance." For one Martian year – the equivalent of two Earth years – the scientists will obtain data that will enable them to draw conclusions about the planet's development and its thermal balance. Until now, this balance has only been measured in a similar way on the Moon. During the Apollo 17 mission in 1972, Eugene Cernan and Jack Schmitt used a hand-operated drill to take thermal measurements at depths of up to three metres. On Mars, this will be fully automated; the sensors will be driven into the ground – centimetre by centimetre – while an infrared radiometer will measure the temperature on the Martian surface. The two sets of data will make it possible to infer the planet's heat flow. While Earth has experienced many changes as a result of plate tectonics, Mars has undergone less radical change since its formation 4.5 billion years ago. "With the InSight mission and its data about Mars, we will also learn a great deal about the early days and the subsequent evolution of Earth." The mission launch is planned for 5 May 2018 at 12:05 CET with a launch window of approximately two hours. Additional launch windows are available each day until 8 June. The timing and duration of each launch window varies according to the date of the launch. The configuration of Earth with respect to Mars is only favourable for a six-month flight duration during this period. During the journey, the 'health status' of the spacecraft and its instruments will be checked repeatedly, and finally – 60 days before entering the Martian atmosphere – preparations for the landing will commence. InSight will enter the atmosphere at 6.3 kilometres per second and land on the northern hemisphere of Mars on 26 November 2018. First of all, the French seismometer will become operational, then the DLR 'Mole' will leave its container and its journey into the Martian surface will begin. This will be a great moment for the planetary researchers. "People have been looking forward to this for a long time – and will finally be able to reap the rewards," says Project Manager, Judit Jänchen from the DLR Institute of Planetary Research.